GET TO OUR GAME: Casting Call for "Goon"
The list of great sports movies is long, but where are the great hockey movies? For the casual viewer, the list pretty much begins and ends with the 1977 Paul Newman classic "Slapshot." Let's throw in "Miracle," starring Kurt Russell, the incredible story of the 1980 Olympic men's hockey team. Even though I'm a child of the 80's, I don't think I could sit through Youngblood again, but you may want to consider watching a few scenes just to marvel at the level of acting going on here. What a performance by Keanu Reeves, as always. When "Youngblood" is third on your list, you know there's room at the top for a new classic. Well, GTOG Nation, we've got one on the near horizon. The movie "Goon," inspired by the story of minor league enforcer Doug Smith, and based on a screenplay by Jay Baruchel and Evan Goldberg, is starting production in Winnipeg next week. 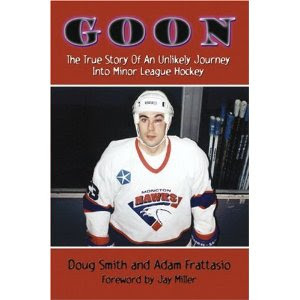 First of all, if you love reading about the culture of hockey and minor league war stories, we highly recommend the book, "Goon." This is not one of those situations where you need to worry about what to do first, read the book or see the movie. Honest. As for the highly anticipated feature film, a GTOG source tells us the script is hilarious. We follow Doug as he mashes his way through the AHL and tries to light a fire under an eclectic and talented but under-achieving cast of characters. Needless to say, he leads with his fists. 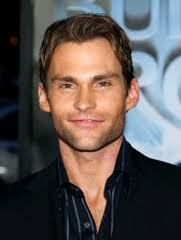 Producers are reportedly close to an agreement with Seann William Scott to play the lead role of Doug. Rumor also has it that Stifler from American Pie is already skating and bulking up for the role. Why Sean William Scott? We know he's funny, he's athletic, and he has the bone structure of Jay Caufield. Not a bad choice at all, assuming he can pack on a little muscle. Jay Baruchel is in as Doug's profane best buddy Pat. But the key to this whole enterprise -- and the factor that could make "Goon" resonate with actual hockey fans -- may be the director. Michael Dowse, an Ontario native and rabid Habs fan, should bring a commitment to authenticity that you won't find in other hockey movies. The major open question is who will play the role of aging enforcer Ross "The Boss" Reardon, Doug's antagonist and the most fearsome fighter in the league. Who could pull this off? Do we give Keanu Reeves another shot, or would that lead to too much unintentional comedy? 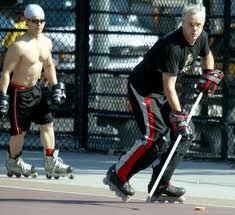 What about an actor's actor who plays hockey, like Tim Robbins? I've played pick-up ice and roller hockey with Robbins, and though he isn't anything special out there, at least he can skate. And he's a big guy. Maybe an action star like Jason Statham? Or should producers really cater to their core audience and cast Tie Domi? Would you not be entertained? Who would you like to see as Reardon? Sound off in the comments, and check back for more "Goon" developments later this week, as we'll have the very latest on casting and other buzz coming out of the Toronto Film Festival. Michael Douse also directed a movie called Fubar which is easily the best Canadian movie of all time. I heard SWS was set to star in Kevin Smith's new hockey movie. He surely wouldn't be starring both. Looking forward to both flicks though. Two Hollywood hockey movies... crazy! WOW this is huge. First off I read this book and its awesome. I looked up this guy Doug Smith and his story and history is amazing so this movie should be great. Never mind the fact that the producers doing it are having some big success with a lot of their recent movies so with a few big Hollywood names involved this could be another classic hockey movie...Bring on the popcorn!!! I have watched Doug Smith work and you could tell he really enjoyed it. It's over due. Doug had a dream and went for it. The book is loaded with funny stories (unlike Rob Ray's book. Yawwwwn)and it gives hockey fans a real inside look at the world of hockey fighters. I heard Ferrelly tried to get it going but the morons at the big studios only looked at it as "Slap Shot II" and passed. I hope it does great! If you have not read the book, do so. It's well worth it. I loved Douggie's book. It had me laughing and shaking my head at the same time. He started here in Winston-Salem, and was a joy to watch in person. Skated almost as badly as I do, fought like a m-fer. I'm hoping the movie will show some early Carolina Thunderbirds pics, or video. The first ECHL CHAMPIONS!! When you go, wear an outfit that compliments your body type and skin tone. Don't wear a lot of makeup and be confident. Be personable and ask questions if you have them. Find out when they will let you know whether they want you to join their agency. Make a note of the time frame they give you. Get To Our Postgame: "I seem to amaze myself."